As I may have mentioned in passing, I have been taking yet another cookery class with Tante Marie. This time round I am learning Latin American Cooking taught by Penelope Alzamora. Penny, a sparkling, passionate Peruvian, has not only been cooking since she was a child, she launched a chain of restaurants in Lima and Chile where she cooked for many years before landing in San Francisco. I have learnt so many new things in the past five weeks and I am already sad that we only have one more session to go. 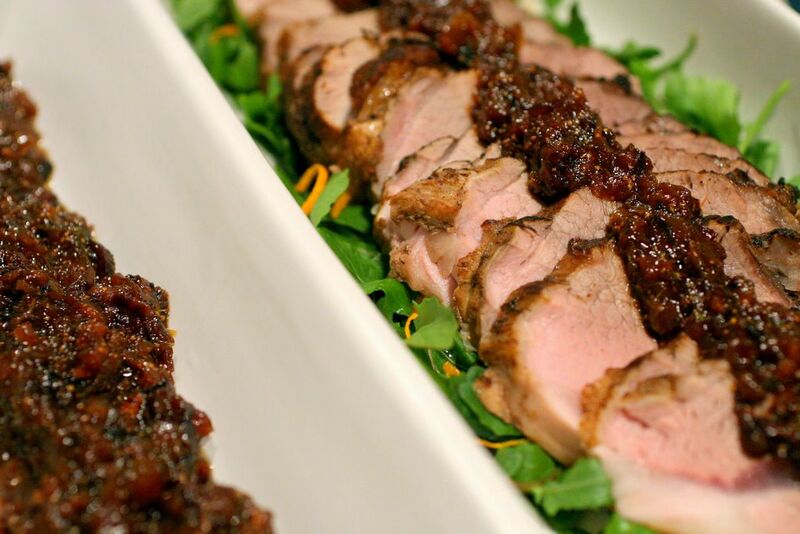 Some of the recipes Penelope teaches us are traditional, whilst others incorporate traditional elements in new ways, like this delicious pork roast recipe that is great for entertaining and can be served hot or at room temperature. I have slightly adapted the recipe from the original she taught us. Serves 6. In a blender process the chipotle en adobe and orange juice until a puree forms. Add the zest, honey, cumin, sugar, garlic, cinnamon, salt and vinegar and further pulse until just blended. 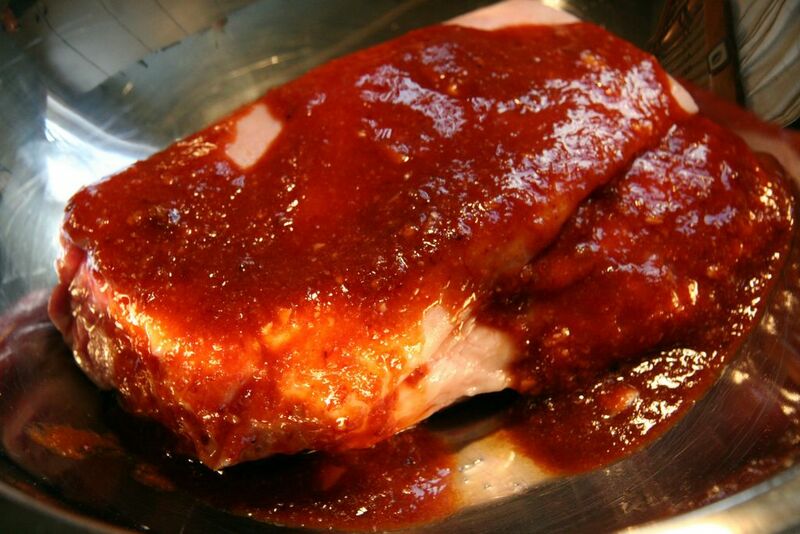 Put the pork roast in a big bowl and coat with the marinade. Cover and refrigerate for at least 30 minutes. 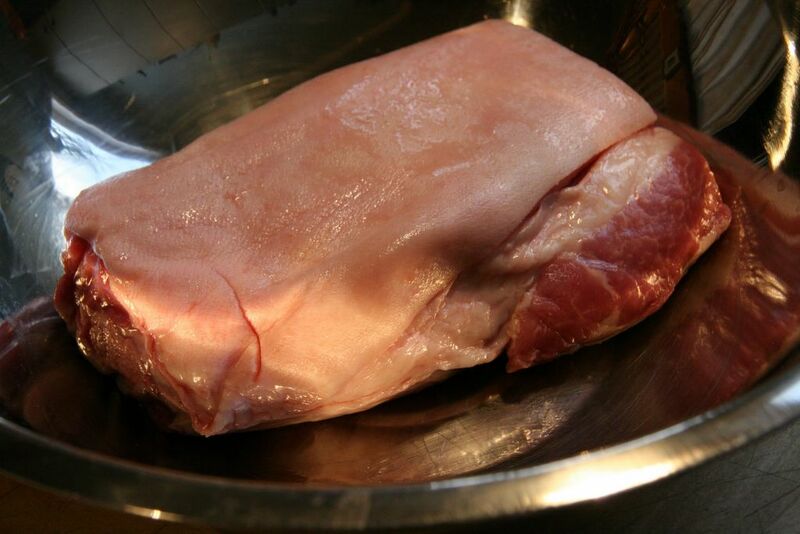 If your roast still has fat, remove and set it aside and then cut slits in the top of the meat. Fill the slits with garlic slithers and sprigs of time and spoonfuls of the mainade. Replace the fat and tie the joint with string. Generously rub the roast with salt, pepper and ground cumin. On the stovetop, heat the oil and butter in a heavy bottomed roasting pan until bubbling. Add the meat and brown on all four sides. Add the wine and onion to the pan. Pop a meat thermometer into the centre of the meat. Cover the pan and put into the preheated oven. After 20 minutes, start to bast the meat every 10 minutes or so, with the juices. When the meat thermometer shows a temperature of 150F, the meat will be cooked. Remove the joint from the oven and allow to rest, under foil, on a carving board, for at least 10 minutes. First use the orange peel to make some decorative curls using a zester. Deglaze the pan with the wine before adding the figs, thyme and orange slices. Simmer for 10 minutes until soft. Remove the from the heat and roughly puree with an immersion blender: This sauce should still be chunky. Remove the string from the roast and carve into slices. Present on a bed of rocket leaves decorated with the orange zest curls. Spoon some of the fig sauce over the meat and serve the rest on the side. Delicious. This roast is definitely on the sweet side and as such does not appeal a great deal to my Fred. Well, he liked the meat, but found the sauce a bit jammy. Myself and and friend Katja had no difficulty polishing off everything on our plates. There is a little spiciness, but it is subtle. Definitely nothing to fear here from people who don't like spicy. Archive Alert! On this day in 2005: Chevre Cheesecake Pots with Caramel and Fleur de Sel, Yum! Hey I am the first to comment! Sam, this is a great blog and the pork sounds delish! My Tom (partner and German) is also not too keen on the sweet stuff either, Germans like their meat hearty ;-) I definately think it will be worth trying out the next time my in-laws are here for lunch. I hope I can find all the ingredients here in our German stores though. By the way you've posted the Pork recipe twice on your blog. That is some beautiful looking pork! Great food sytling as well. What an intriguing recipe.... I think I must give this a try! Yeah, it looks very tempting. And thanks for the chipotle en adobo recipe because I was just trying to some in the supermarkets to no avail! love this combination of spicy and sweet fruit....sounds like tante maria's has definitely got some good things goin on. How do you like the classes? I would love to take some. I have been trying to convince my dear S that he DOES in fact like pork (too many years of overcooked chops have turned him against the notion). The balance of sweet, savoury and spice in this recipe sound like it just might do the trick. I've had success grilling roasts on the barbeque in the summer ... this marinade seems a perfect fit. Thanks, once again, for the inspiration. Yum, Yum, Yum!!! Those all sound too tasty!